I’m typing this wondering where this year has gone….. My son finished up his last day of high school today and I think I may be a tad emotional about it. Seems like only yesterday he started primary school and now he’s about to head into the workforce! Well, into the workforce after he attends schoolies first – not looking forward to him partying it up for 10 nights with half of his school in Rye. That little coastal town is going to hate this time of year! Time for a new sketch at Freshly Made Sketches. This week the amazingly talented Jen Mitchell is our hostess. Here’s her great sketch – so many possibilities with this one. Because Christmas will be here before we know it, I’ve gone with another Christmas card. 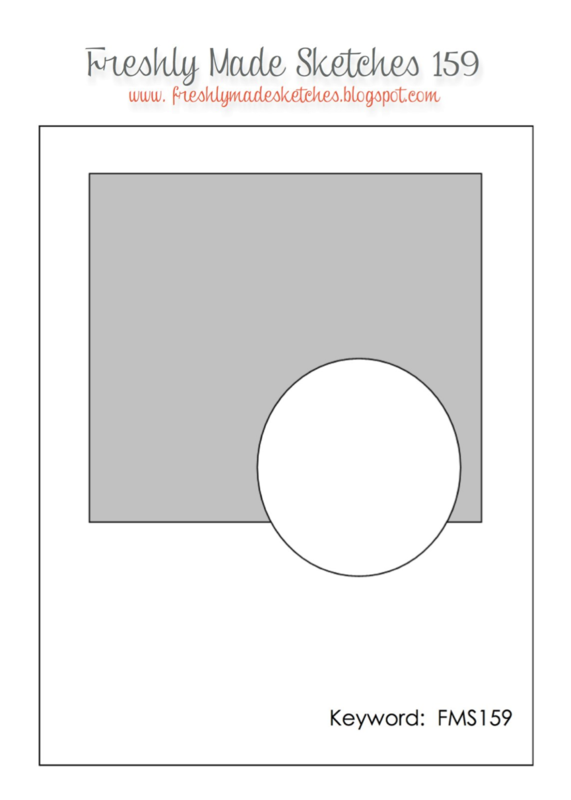 I decided it was time to create a shaker card so I’ve used the circle from the sketch to make a bauble shaker. The sentiment I’ve used is from Stampin’ Up!s Bright and Beautiful and the little snowflakes I’ve stamped in the shaker are from Endless Wishes. 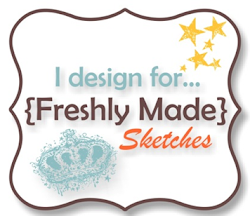 Come and join us this week at Freshly Made Sketches. Head over to the challenge and check out the gorgeous inspiration from the Design Team. Your shaker ornament is fabulous – topped off perfectly with that wonderful bow! And yep it is hard to watch your kiddos enter the real world! Super sweet, can you school me on how to make that shaker? I would love to make this! Good on you for making a shaker card – I really must give that a go sometime! Beautiful card! And I can relate with your son finishing school – my boy is also finishing school in a couple of weeks and heading into a full-time trade course next year. No schoolies over here though – thank God! The ornament is perfect for a shaker card! I love it! A shaker ornament — how cool! And I love that red bow. I learned something new from your post — I had to google “schoolies.” What a double whammy for parents in Australia — graduation and having your child leave for ten days of partying. I’d be a mess! So pretty! I love the pops of Cherry Cobbler with all the black and white. Oh Narelle! This is amazing! Love the DSP you’ve chosen and how fabulous that little red bow looks! Oh and that shaker box – fabulous! Great job Narelle! How can you have a son graduating high school?! You’re far too young!!! What an awesome idea for a shaker card! Love the striped paper and the big bow, so festive! I love…love this shaker card,Narelle!! The rhinestones with the big bow look SO beautiful!! Stunning! !